HEAVY RAINS AND snow have wrecked several informal settlements housing Syrian refugees in Lebanon and have left thousands in need of emergency assistance, according to aid workers. “Look at this weather, we are cut off from everything, the tent has collapsed, we turn to God,” one refugee there told AFP as snowflakes landed on her black headdress. “The storm arrived yesterday and more than one metre of snow has fallen,” another refugee said. Snowfall is not unusual in the area but Lebanon has in recent days been hit by a prolonged patch of severe weather and a storm dubbed Norma. The United Nations’ refugee agency (UNHCR) said emergency measures had been put in place to rescue stranded families and help those suffering from the cold. 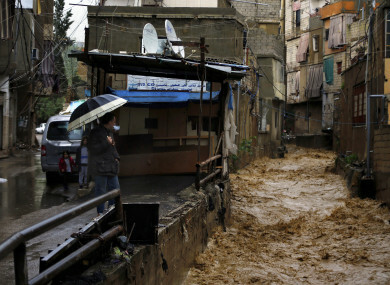 “Across Lebanon, at least 66 informal settlements have been found heavily impacted by the flooding, 15 of which have completely flooded or collapsed,” UNHCR spokeswoman Lisa Abou Khaled said. “Around 300 people have been relocated so far in the north and the (eastern) Bekaa” region, she told AFP. “UNHCR and partners estimate that approximately 850 informal settlements, hosting 50,000 refugees, are at risk of flooding,” Abou Khaled said. Tents were flooded in a camp in the northern province of Idlib, Syria’s last rebel stronghold which borders Turkey. “The flood took away everything in its path: tents, cooking (equipment), covers,” said Faisal Abu Zeid, originally from the neighbouring province of Hama. “We don’t have food or water… 25 families have found refuge in the mosque,” in the border town of Atme, he added. Email “Heavy rain and snow wrecks Syrian refugee settlements in Lebanon”. Feedback on “Heavy rain and snow wrecks Syrian refugee settlements in Lebanon”.